10 months & up. 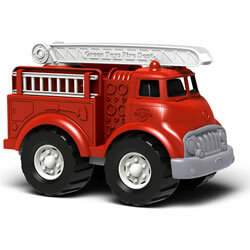 This set of chunky vehicles will bring imagination to life from adventures in the sky to life on the streets around town. 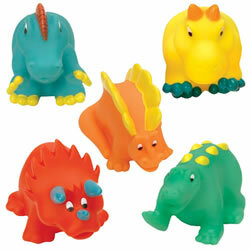 Sized just right for toddler's hands to push and play. 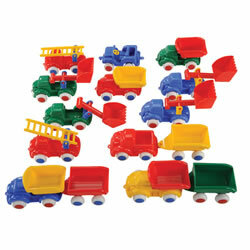 Set includes a plane, helicopter, bus and dump truck with removable load. 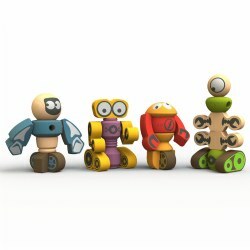 Each vehicle measures approximately 5" long. 18 months & up. 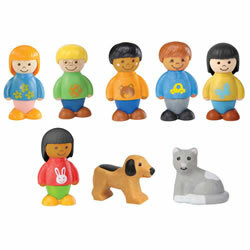 Six friends ready to go on adventures along with the neighborhood's dog and cat. 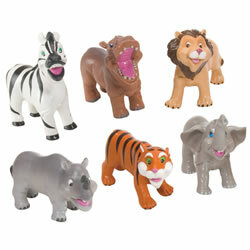 Great for role playing activities and developing oral language skills. 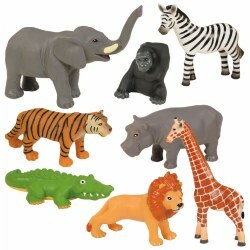 Each friend measures 2 3/4" tall and twists at the waist. 10 months & up. 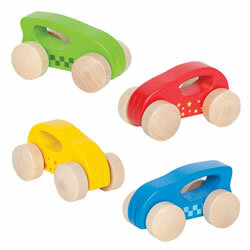 Child-sized wooden vehicles in 4 colors and two different graphics: checkered and blossoms. 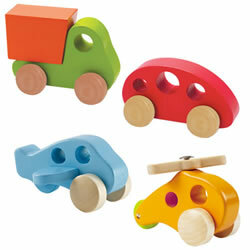 Features vibrant colors, smooth edges, natural wooden wheels and easy grasp design. Cars measure 4" L.
18 months & up. 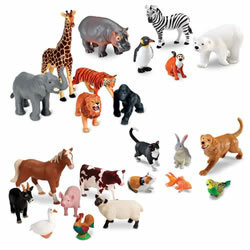 The wild animals in this set are detailed in texture, traits, and size. 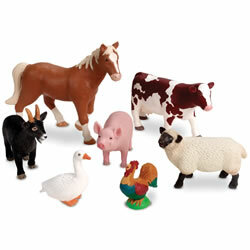 Children will enjoy learning about each of the animals through engaging, hands-on learning experiences. 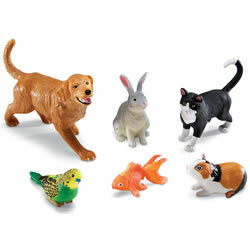 Each set comes with eight animals and an activity guide. 18 months & up. 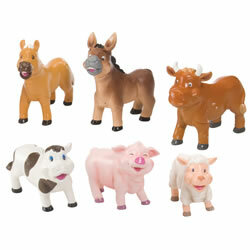 These four farm families are visually appealing and have a smooth, inviting touch. 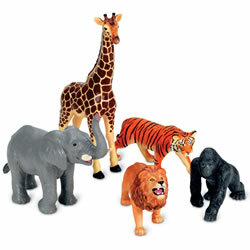 Each family has an adult male, adult female, and one offspring. 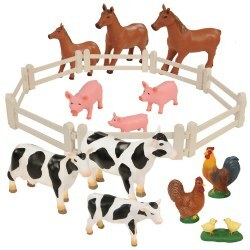 The set also includes eight fence segments to engage young children in educational play. Activity guide included. Bull measures 6 1/4"L x 4 1/4"H. Calf measures 3 1/2"L x 2 1/4"H.
18 months & up. 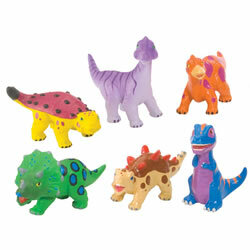 These chunky figures were designed for small hands and allow for easy gripping during play. 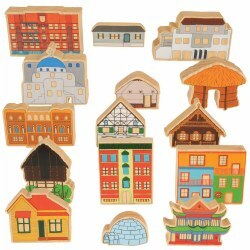 This charming family set will have young children engaged in meaningful dramatic play either independently or with friends. 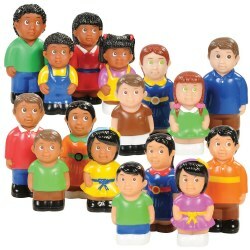 Each family includes an adult male and female and a male and female child. Father measures 5 3/4"H and child 4"H.
12 months & up. 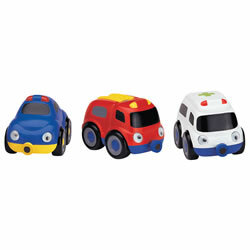 Adorable vehicles, each with their own personality, link together for follow-along fun. 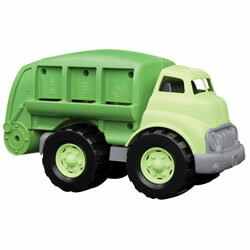 Features include real axles and wheels for true rolling action plus magnetic connectors at the front and back to allow them to line up and be pulled along. 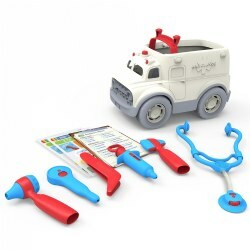 Car measures 2 3/4"H x 4 1/2"W x 2 3/4"H.
1 year & up. This School Bus is open on top so you can load in passengers and maneuver the bus around the room. 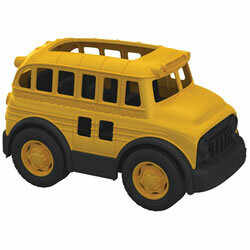 Play with this school bus indoors or out. 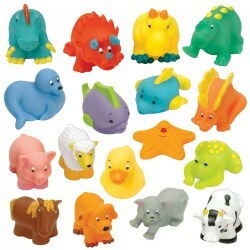 Easy to clean, can even go in the dishwasher. Made from 100% recycled milk containers, this bright yellow school bus features metal free axles, chunky wheels and open roof for easy access. 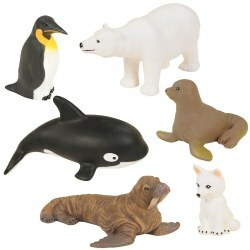 BPA, PVC and phthalates free. Approximately 10 3/4"L x 6"W x 6"H. Made in the USA.